The collaboration between the Nordic countries and the state of Sabah, Borneo, Malaysia, has a long and rich history. In 1999, a 4-year project was initiated between Yayasan Sabah and DANIDA (Danish International Development Assistance) that resulted in the preparation of a Strategic Management Plan for the Maliau Basin Conservation Area, and the establishment of Maliau Basin Studies Centre for the purpose of research, conservation, education and eco-tourism. Generous sponsorship has also come from the Swedish company IKEA who among others funded satellite camps, trail and bridge construction and the Maliau “Sky Bridge”. IKEA also supports the INIKEA project, which aims to replant 40.000 ha of degraded forest with indigenous species, perhaps, the largest rainforest restoration effort in the world. Thanks to a generous grant provided by Aage V. Jensen Charity Foundation in 2014, the management plan for Maliau Basin Conservation Area was updated under consultancy of NEPCon, Denmark. The updated plan strengthened the conservation and restoration of surrounding forests to provide a crucial buffer zone surrounding the protected area and connect Maliau Basin Conservation Area with other protected areas. 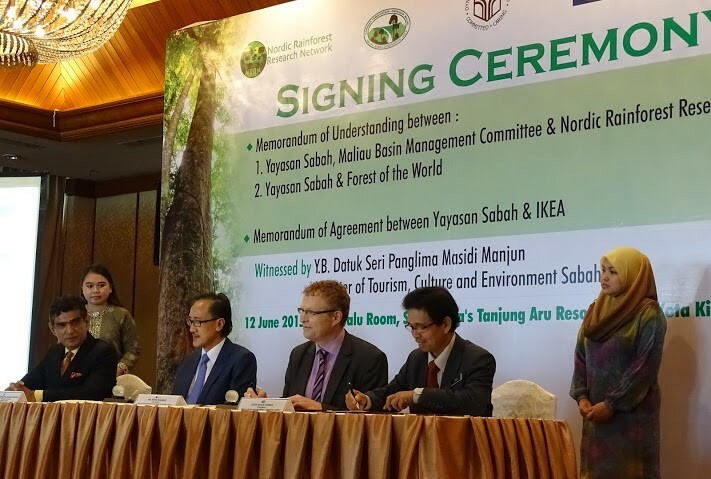 The NRRN aims to build on this fruitful collaborative history and ensure the presence and contribution of Nordic countries to the conservation and recognition of the pristine and unspoiled natural environment of Maliau Basin Conservation Area and its unique surrounding areas on Sabah.